Growing up I had to watch my parents suffer through the Great Recession. My mom has always struggled with depression and struggled with maintaining a job. My mom’s boyfriend was a construction worker and got laid off due to having no business to make money. We lost our house when I was 15 and had to move to a very rural area in Tennessee (Hour and a half drive from Nashville). Obviously when it came to my parents there just wasn’t any job security and, unfortunately, this is the case for many families across America. With different experiences, we all grow to have a different perspective. I grew to understand that you can’t put all your eggs in one basket. You need to diversify your portfolio. When it comes to Uber, picking up other riders isn’t the only way you can make money. In fact, there are many different methods of making money with Uber. One of those methods is referring other people to drive for Uber. Uber is trying to expand as quickly as possible and has a lot of cash from many investors to do so. In order to grow Uber is still handing out a massive sign up bonus to attract more and more drivers to the platform. A few drivers have taken advantages of theses bonuses while most have not. 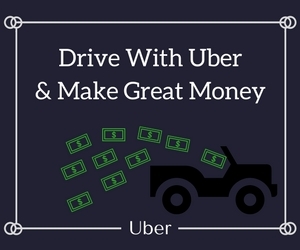 Today, I’m going to teach you how to refer new Uber drivers and make $1,000’s of dollars in the process. What Are Uber Referral Bonuses? Uber referral bonuses are double-sided bonuses that will pay both you, the referrer, and your friend, the referral, money once your friend has finished signing up and started driving for Uber. Your friend must be a new Uber driver and complete a specific amount of trips in their city in order for you to qualify. When Uber first started they were paying you $500 just for taking your first trip with them. Nowadays, the bonus and trip requirements vary city to city. The bonus can range from $50 or $100 for taking 10 trips all the way to $1,000 or more for taking 100 trips in your city. This means that both, you and your friend, could potentially earn $1,000 each once your friend takes 100 trips providing you’re in a city that is offering that high of a bonus. Step 1– sign up to become an Uber driver. This is a must because you can’t make money referring other drivers unless you are a driver yourself. Step 2– Once you have signed up and completed the whole process you will be given a referral code to use to refer other people. Step 3– Log onto your Uber partner app and then click the “earnings” tab at the bottom of the app. Step 4– Once you have clicked on the “earnings” tab, you will be brought to where you can see how much you’ve made with Uber. The $700 you see below is from referral bonuses that I’ve earned for the week from two other drivers that signed up with me. Under the income, you will see an “Invites” tab. Click on that to start referring others. Step 5– After you click on the “invites” tab, you should see your invite code. Mine is the 41HH6UE. If you have friends that are interested in signing up with Uber, you can invite them through your contacts. If not, then share your link with the many followers you may have on different social media sites, Facebook to name one of them. Step 6– Once someone has signed up as your referral, you should receive an email similar to the one below. Step 7– Now it’s just a matter of waiting for your referral to start driving and to finish the required trips for you both to receive a referral bonus. You can’t really track a drivers progress, but Uber does send you an email when your referral takes their first trip, as well as when they complete the requirements to earn the bonus(See below). Another way of referring drivers is through your desktop. First, you will want to go to Uber.com and sign into your account. Once there, click on the tab at the top left and go to Invites. Here you will be able to see all your invites, as well as the earnings. plus, you can invite people with your code this way as well. In your quest for referring new drivers, it’s important to know the methods you can use. While I have not tried every route below. There are other drivers that have used them with success. It’s all about being creative. Add your referral code, maybe a phone number to call you if they have questions, and of course your name. Vista print will do something like 500 cards for $10. You can create a website like the one you are on and it literally will only take 30 seconds to do. Write articles about Uber and other ridesharing services. You would put your invite link on your website for people to sign up through. there are very few that take advantage of online marketing, but it can be pretty lucrative. When somebody in college or at work talks about needing extra money you could causally present the opportunity and talk about how they could a get sign up bonus by going through you. But don’t just talk about the bonus, talk about the flexibility and perks of being your own boss too. Facebook, Twitter, and many other social media sites you can post your link on as well.However, careful on posting in Facebook groups because a lot of people may report you for spam. Only post on Social media where the content is your own, like your profile or your own page. People watch more YouTube videos than cable television nowadays. So, if there was one place you should market it probably should be YouTube. Make a whole bunch of different videos talking about Uber. Topics could be about Surge pricing, how Uber pays you, or maybe the different kinds of promotions Uber has going on. The more videos you make, the more subscribers. The more subscribers the more money. Have you heard of Uberman? He’s one example, of somebody making good money from Uber referrals because of the hundreds of videos he’s made about Uber as well as other services. Uber drivers, in the past, have taken minimum ride fares for other companies like Lyft to convince those drivers to try out a different rideshare platform. Think about this for a minute. You’re an Uber driver. Every person you refer in your area you get $700. If every Lyft ride is $5 and it takes you 40 rides to get one sign up that completes the bonus requirements. You will profit $500. $5 x 40 rides= $200 spent. $700- $200 in expensive= $500 for your hustle. This can be a risky tactic to try, but if it pays off it will pay off real good. Just double check what the bonus is in your city before you go crazy with this method. Make sure to sign up as a Lyft driver so you can use this method on both platforms. Have you heard of Joseph Ziyaee? He made $90,000 in 6 months referring other drivers. He did this by finding people online and driving to areas where drivers are needed so he can meet them personally and help them out. He even turned his living space into an Uber centric house. Why Would I Want to Refer More Drivers? Won’t That Jeopardize Your potential Driver Earnings? A lot of drivers limit themselves by thinking like this. And I can understand why you don’t want to saturate your market because you feel things will become slower. But here’s the issue with that logic. Most drivers are off the road after their first year of driving. So there’s a lot of old drivers just being replaced with new drivers. Part of the reason is a lot of people already had jobs before signing up to drive. Other times people just want to supplement their income while they transition to do a different job or different life for that matter. Furthermore, most people that sign up to drive with Uber don’t do it for the referral bonus. They were already planning on driving. So why not earn some money in the process? Lastly, if you can make $30,000 in referrals and you end up saturating your market a bit in the process, isn’t that okay? You make a little less driving, but you earned that all back plus way more because of all the money you made without having to drive. You saved money in wear and tear with those referrals. I think it’s worth the trade-off. Yup, that’s right! You can refer as many people as you want to drive. You can refer 1, 12, or 25,307 Uber drivers. It’s just up to you how much you’re trying to make. It won’t be easy referring that many people, but the payoff would be worth it. Not only that, you would be making money with Uber without even driving. How cool is that? So tell me, how many people are you going to refer? If you haven’t signed up for Uber yet you learn how here.